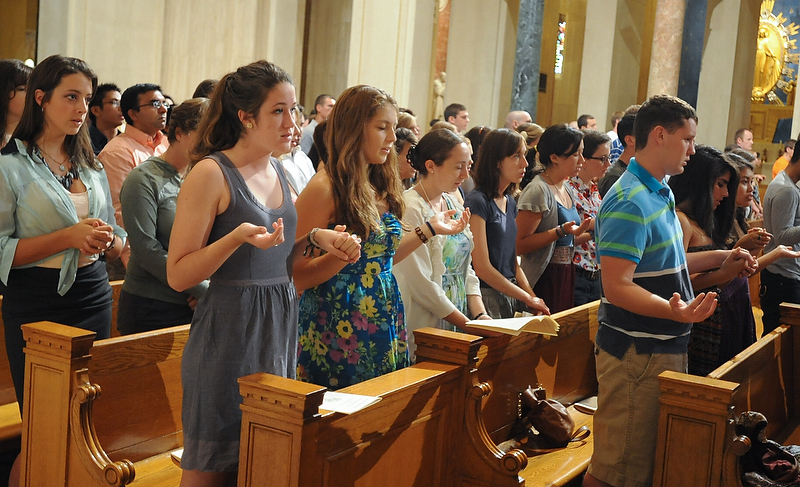 There are many reasons why people say they do not attend Mass anymore. Among the reasons they quote, one is their perceived hypocrisy of Catholics who worship faithfully. They accuse Catholics of being all talk and no action. Sometimes of course these accusations are unfair and reveal more about the mindset of the person making them than the Catholics they are attacking. Many times the person making this accusation is being self-righteous and sanctimonious, just like the young man in Dostoevsky’s novel who clearly sees through the hypocrisies in his society. Dostoevsky titled the work, “The idiot”. But sometimes the accusations are spot on! Sadly, there are many Catholics who are very bold in what they say and what they do at mass and wear flashy religious items for people to see, but whose actions betray them to the point that people might say, “if that’s what being a Catholic is all about, I want no part of it!” As Catholics the worst thing we can do is be hypocritical. We cannot simply talk about how much we love God without actually doing it. Pope Francis is certainly showing us that in teaching us to be concerned about the needs of the poor and looking out for other people. Many times, though, the hypocritical situations have nothing to do with the social justice teachings that we lack but simply the courtesies and the common charity that are missing in our relationships with friends, coworkers, and family members. I am amazed sometimes when I watch what quarreling spouses will do to each other. These are people who once promised to love each other for the rest of their lives and for whom the other person is supposed to be the most important person in their lives, and the mean, vindictive, and downright cruel things that sometimes they’ll say and do to each other is deplorable. People who give a lot of money to poor people in foreign lands but who treat their loved ones like garbage are not fooling anyone. Others will see right through us and only see a phony. We are hardly being a good example of Christ to others if we are not loving those around us and if we are not trying each and every day to be the best person we can be. To put it simply, our faith is not just for an hour on Sunday. We will impress no one by our prayer on Sunday if we forget about it on Monday. Are we trying to live as intentional disciples of Jesus? Are we going about each and every day trying to be the people that Christ wants us to be? Are we intentionally working to be people who bring Christ to everyone we meet and who live the gospel each and every day, for whom faith is not merely a creed we follow but a way of life? If we are not actively and consciously working at this each and every day, then the clear answer to us is “no, it is not!” Honest people will forgive us our shortcomings and sins, but they will not forgive hypocrisy. The world doesn’t need a lot of hypocrites. 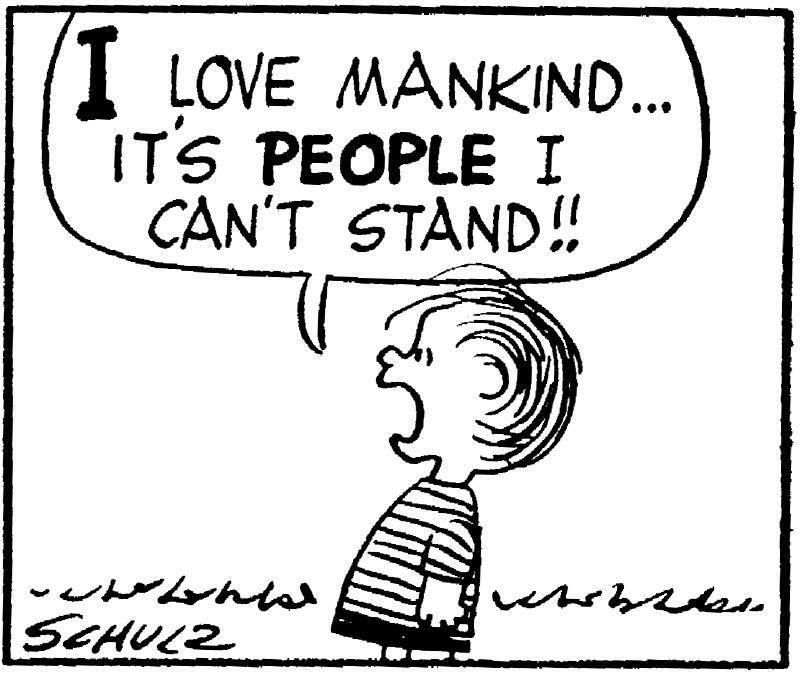 The world doesn’t need a lot of people going around telling God how much they love him; the world needs people who tell God they love him and show it by their love for one another, whether it be the poor, people in foreign countries who are in need, or the people in our own families, our neighborhoods, our schools, and our workplaces. Christ’s love extends to everyone and no one is outside the reach of his love, especially those closest to us. If we wish to truly be effective Christians who lead many people to Christ, there is no escape from loving one another as Christ has loved us. How do I get someone who has stopped going to Mass to return? A common question I receive from many people is how to get their loved ones who stopped going to church to attend church again. This is especially true from parents of adult children who lament the fact that they brought their children to church every Sunday and taught them to be faithful to Christ and follow everything the church teaches, and often the children not only don’t go to church but don’t even bother to have their grandchildren baptized. They ask me, “What can I do to get them to return to church?” There is of course no easy answer to this question and certainly no one answer that would settle all situations. It’s almost easier to say what we should not do rather than what we should do. One thing I always remind people that is never going to work is nagging people. You know very well for, for example, that parents with teenagers, if you nag them and nag them, you can guarantee you’re going to make sure they never do what you asked them to do. The same thing can be said of grown children and anyone else who leaves the faith. There will be many different reasons why people have stopped worshiping. Some people are perhaps disillusioned, others maybe have problems with things we believe, and for many others it’s just not important enough to them. But in the past it seems to me that our approach has often been to harp on people and to be negative, to try to convince them that they’ll go to hell if they don’t worship God or threatening them with harmful things that will happen to them, that God might even punish them for not attending Mass. Or we may point out their faults and try to get people to start attending because we tell them that they’re not good enough people. Yet such an approach rarely works well. Whenever we put people down, we tend to treat them as less than ourselves. We place ourselves in a superior position and condescend to them as if somehow we are better and we’re going to help them be as good as we are. That often can come across rather pharisaical and insulting to the individual. Instead, I suggest witnessing to them about the difference that faith makes in our own lives. Letting people know why we worship God and what we get out of being disciples of Jesus is a far more powerful way to convince people to worship than to tell them why we are better than they are or why they are sinful because they are not doing what we do. As the old expression says, “you catch more flies with honey than with vinegar!” If people see us living a life in Christ that has made a difference; if they can see that our worship has made us better people, has given us a happiness in life that they don’t know or that they would like to know, then perhaps we will bring them closer to the Lord. Leading them by desire rather than by force is certainly a better way to bring them into a faithful relationship with the Lord. We also have to be intentional disciples; we have to be living out our faith and desiring to bring Christ to other people so that they can see by our love and our actions the difference it makes, so that we are a living example to them of how faith works and how it makes a difference and is a positive attribute in our lives. Writer Madeleine L’Engle observes: “We do not draw people to Christ by loudly discrediting what they believe, by telling them how wrong they are and how right we are, but by showing them a light that is so lovely that they will want with all their hearts to know the source of it.” I often feel that in the past our approach has been all the wrong way and has turned more people away from Christ than towards him, even though our intentions were very good. Be the light of Christ; show him to the world in your words and actions. Let people see the difference Christ has made in our lives by our conscious decision to follow him, how he has given us strength to endure even the most difficult of situations and come out unharmed, and they will be compelled to want to join us as well. Get away from that apple! Eat it and die!!! 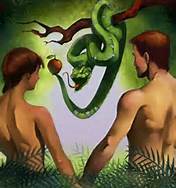 Question: What was really going on in the Garden of Eden? I can’t believe God would actually condemn Adam and Eve just for eating an apple from a forbidden tree! Answer: Your instincts are correct. There was more going on in this story than meets the eye. First, let’s look at what God created: He created Paradise – a perfect world, and he basically told Adam and Eve that it would remain perfect as long as they followed what was true, in other words, to do what God told them: “Follow me, and you’ll be fine!” What was the name of the tree they could not eat from or even touch lest they die? It was the Tree of the Knowledge of Good and Evil. Whether or not it was an actual tree or simply a metaphor really doesn’t matter. What matters is what God was telling them. In effect, he was saying, “Don’t try to decide for yourself what is right and what is wrong. You can be wrong; I cannot! I am all Goodness, all Beauty, all Truth. I am perfect; you are not. Listen to me and do what I tell you and everything will be perfect.” But Satan, in his war against God, decided to try to get back at God by harming us. He knew that it would hurt God tremendously to see his children suffer. Any parent will know that feeling. It is far worse for a parent to watch their child suffer pain than to suffer that pain themselves. So Satan starts with a lie: “Did God really tell you not to eat the fruit of any of the trees in the garden?” Eve answers correctly: “We may eat the fruit of the trees in the garden; it is only the fruit from the tree in the middle of the garden that God said, ’you shall not eat of it or even touch it, lest you die.’” God was not forbidding them pleasures. Some people like to think that if we are enjoying something it must be sinful. (Harold Camping used to say that.) There are many legitimate pleasures that God gives us to enjoy. He is not trying to make our lives miserable. Satan then drops the big temptation: “You surely will not die! No, God knows fully well that the moment you eat of it you will be like God yourself, knowing right from wrong!” In effect he was telling Eve that God was the one being deceptive. The only way God could keep them under his control – so said Satan – was by telling them not to follow their own hearts and minds. If they did, they would no longer need God. He successfully convinced them that God was the liar, that he was merely trying to control them and keep them from breaking free from under his power. So they ate the fruit – they listened to their own minds and hearts and not to God. And with that “their eyes were opened” and did they discover that they knew right from wrong on their own? No! They saw that they were naked! They saw their shame. And Satan didn’t respond by saying, “Gee! I thought they’d know right from wrong! I guess I was wrong!” Of course not! He knew very well what the result would be. By disobeying God they gave Satan his entrance into the world – and that’s why we have all the evil we do in this world! Original Sin brought it in! Now, how many times do we hear people say, “Why do you think you have to listen to everything the Church teaches or parrot every word the Pope says? You have a brain; think it out for yourself!” (I actually had someone ask me that very question once at a wedding!) What are they telling us to do? They are telling us to commit Original Sin all over again! Our hearts and minds are not infallible. You and I can be mistaken, and just because we feel it or think it doesn’t make it right. Only God’s word is truth. Therefore, those who tell us that God’s teaching through the Church is wrong because “they don’t feel there’s anything wrong with it” are committing Original Sin all over again! They are buying the devil’s lie; they sucked it in hook, line, and sinker! What we see from this is that God’s law is not subjecting us to him; that was Satan’s lie. Rather, God’s law is freeing us from error. It is the truth that we can follow with confidence. God’s way is not always the easy way, but it is always the right way. So, by following God’s law, we are not so much subjecting ourselves to him as sharing in his power! Sin enslaves; God frees! When we follow God completely, we are free from the errors of sin – we are truly free! Jesus, the New Adam, reversed Original Sin by His total obedience to God. He showed us that obedience to God brings salvation, just as Adam showed us that disobedience to God brings suffering and death. So the lesson we learn is simple: don’t try to decide for yourself what is right and wrong. Don’t merely follow what you think or feel because you can be wrong. Follow what God tells you at all times and you will truly be free! From Ashes to Easter: will we grow closer to God? When I was in the seminary, I was once thinking about what to give up for Lent, and I realize I liked a good cup of coffee after dinner. So I decided to give up my coffee after dinner during Lent. But as I entered Lent I discovered I needed something to settle my stomach after dinner, so I decided, “Well, tea is not coffee; I can drink tea!” I never used to drink tea, but I thought this would be a good alternative. Lent came and Easter followed, and I found I enjoyed my tea very much, so I continued to have tea after supper every night instead of coffee. Then the next year when Lent rolled around I was looking for something to do and I said, “I can give up my tea and have coffee instead!” I could go my whole life going back and forth from giving up coffee and tea and never really doing anything penitential. That could almost be like a child who gives up vanilla ice cream and has only chocolate, and the next year gives up chocolate ice cream and only has vanilla. I think we can all see how pointless such an observance would be. But then sometimes maybe we tried to do too much. We get overambitious and we set unreasonable goals for ourselves. For example if we were to say “I’m giving up TV for all of Lent”, we might find that a little bit too much to handle. So maybe just giving up a certain amount of TV during Lent, maybe pick one day of the week – perhaps Friday – and give up TV on that day. But sometimes we are perfect at what we decide to do, and yet Lent still doesn’t have the full effect that it could. Imagine, for example, you decide to give up candy during Lent and you’re good; you don’t touch a piece of candy for the entire Lenten journey. Then Easter Sunday comes and you get yourself an Easter basket and you go on a binge and you eat all the candy you would’ve had during Lent and then some, and quickly discover on Easter Monday you’re no different person from what you were on Ash Wednesday. Well, if that’s ever happened to you – and believe me it’s happened to me many times – then perhaps were only going about things as a battle of willpower or perhaps just doing penance for our sins but not maximizing what could really happen. 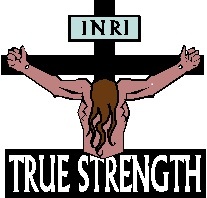 Ideally Lenten penance should be aimed at helping us grow in the virtues we need to achieve, so if I know there’s a certain area that I need to improve in my life, I should look for a Lenten practice that will help me grow in that area. Let’s take one example: if I’m always the type that does binge spending, that I buy whatever I want whether or not I need it, an effective penance for that would be to agree that every time I buy something for myself that I don’t really need I give the equal amount of money to the poor. That would end binge spending rather quickly! But whatever we choose to do, nothing will make any sense if were not joining it with prayer, and sometimes that can be the thing that is most lost in our Lenten journey – praying. Perhaps it’s because we don’t have a barometer – something to measure whether or not were improving in prayer. It’s easy for us to know if we’ve faithfully avoided eating candy all during Lent, but to say I’ve improved in prayer? How do we measure that? I think the best thing to do is to set ourselves a practical and physical goal, perhaps of spending a certain amount of time in prayer every day and remain faithful to it. Don’t try to make it too much; don’t say you’re going to spend three hours in prayer every day: you won’t do it! Some people could say they will spend an hour every day and keep to it, others maybe only a half-hour or even 15 minutes. 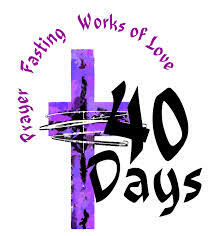 But if we commit ourselves to a reasonable amount of time every day and make sure we do it then we will be praying every day and that prayer will be the piece necessary to make all of the rest of our Lenten observances more profitable for us spiritually. So set a small reasonable goal, may be just a few minutes every day, whatever is appropriate for you, and if it comes to a day where you’ve completed the time and you want to spend more time, great! Now we are really growing in our prayer because were looking for more time. So in addition to the traditional things we do of self-denial and almsgiving – reaching out to the needy – let us not forget to add prayer into the mixture. Here at St. Ann’s Parish we are giving everyone who comes for ashes on Ash Wednesday a little packet where there is a card on which they can tell us what they did in the course of the week – all anonymously – and then just put the card in the Sunday collection, and will tally it and show the parish how much we collectively prayed during the past week. Hopefully, we will see ourselves as a parish growing in prayer. We can also do that for ourselves. If we started with 15 minutes a day in the beginning of Lent and ended with a half-hour, we will have a concrete measuring rod to show how much we have increased our time in prayer, and if our time in prayer has grown, I guarantee our quality of prayer will have grown as well, and when Easter Sunday comes around we will discover we did not merely battle our willpower to see if we could give up chocolate or whatever it was for forty days, but we will truly have grown closer to the Lord in our prayer, and we will be different people on Easter Sunday than we were on Ash Wednesday. A blessed Lent to you all!